Each time I travel to Florida I have set the expectation of laying in the tropical sun and returning with a tan that would make the Bain de Sole tan woman jealous. However; the last few trips have been met with sub-seasonal temperatures, daily storms and fading of any skin color I had prior to my arrival. The cool weather and thunderstorms that plagued our trip caused me a great deal of frustration. Why? Because I set the entire state of Florida up to fail with my unrealistic expectations. Right now you may be thinking, gee Sue sorry about the stinky weather on your vacation but what the H-E-double hockey sticks does this have to do with anything? I’m glad you asked! 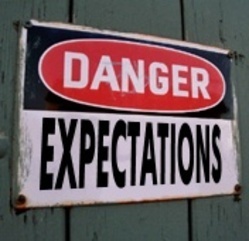 In my 20+ years working in geriatric healthcare, I have met hundreds of caregivers that have, for most of their adult life, set completely unrealistic expectations for their family and have spent the majority of their life disappointed. They’ve created the expectation that, THIS TIME, mom will say “thank you” for all I’ve done to help her out. Or expect that their siblings will suddenly offer assistance, either physically or financially, to help meet a parents care needs. The reality is that these expectations actually set those people up to fail. This, ironically, usually causes us to be upset. The problem with upset is that we tend to carry it around with us to other areas of our lives and dump little pieces of our frustration out on unsuspecting bystanders such as our spouse, children and co-workers. So what can we do to stop the upset? Stop setting unrealistic expectations! As simple as this seems, implementation can be a bit more challenging. Evaluate the situation BEFORE you arrive. Example: if you are going to visit family in another state and you know that taking them in smaller doses will be better for your health both mentally and physically, then stay at a nearby hotel where you can de-brief and re-group. Don’t set expectations for the time together. Be open for anything which allows you to more easily go with the flow. When visiting a family member with a cognitive disorder (ex: Alzheimer’s, traumatic brain injury), learn everything you can about the disease in order to separate the disease from the person afflicted with it. When discussing care needs with your siblings, be direct and to the point about what you need help with. Your siblings are not mind readers (unless they are and then you have every right to be upset because they should have known). Ask your spouse or a close friend to help evaluate your expectations. Sometimes an outside perspective is essential to helping us face those around us in a more realistic manner. This entry was posted in against all odds, aging, boomers, caregiving, encouragement, work/life/flex, working caregiver and tagged against all odds, aging, boomers, caregiving, caregiving and stress, encouragement, expectations, failure, family dynamics, stress, work/life/flex, working caregiver. Bookmark the permalink. Great story and insights as always Sue. I always learn and get a better more complete perspective from you. As a ‘Senior Advocate’, I appreciate and respect all that you do for we share the same passion; helping people as they age. Being a Reverse Mortgage Specialist, I am finding more and more aging homeowners who engage in a reverse mortgage so as to ‘age in place’ and ‘Use Their Home to Stay at Home’. I have found that the cost of ‘in-home-care’ is one of the most common expense needs to do a reverse, hence your caregiving stories are great. Keep up the good work. Steve Thoren, CSA (Certified Senior Advisor and Reverse Mortgage Specialist). What i don’t understood is in fact how you’re now not really much more smartly-appreciated than you might be right now. You are so intelligent. You know thus considerably with regards to this topic, made me for my part believe it from numerous numerous angles. Its like men and women are not involved except it is one thing to do with Girl gaga! Your individual stuffs outstanding. All the time care for it up! Have you ever considered writing an e-book or guest authoring on other sites? I have a blog centered on the same ideas you discuss and would love to have you share some stories/information. I know my subscribers would value your work. If you are even remotely interested, feel free to send me an email. Sue, you make a great point – my wife and I have a saying, or MO that we set the bar low on many things so we aren’t disappointed. We do this for the holidays, meaning we don’t get so bunged up with high expectations, and then, naturally, the holidays turn our nicely, and exceed what we expected. It’s a great mental trick that works in many situations, including with family.